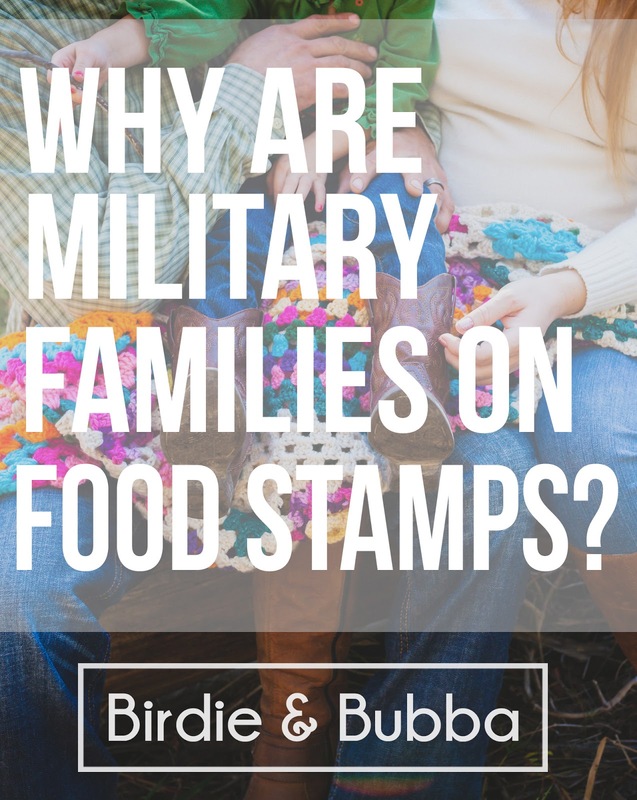 Why are Military Families on Food Stamps? Disclaimer: While I have never used these assistance programs myself, I have researched this topic as thoroughly as possible. Experiences with food assistance programs vary greatly and can be good or bad. I am trying to present as many sides of this story as I possibly can. There is a stigma in the military community when it comes to reaching out for help. "If you cannot support your family then how can you support your fellow soldiers?" is just one of the many responses I got when I asked the question, "Do you think military members should have to be on these programs? Is there an alternative?" This is a subject that I can stir up a lot of opinions. This topic is a divisive one among military members and their families. Some say we should help our fellow man so we can move forward as a stronger country but others are more "pick yourself up by your bootstraps and work harder" kind of people. To make matters even more interesting, there isn't a lot of information out there about military families using food assistance. According to the USDA's Food and Nutrition Service, there are five different programs available to military families. Eligibility can vary based on location, income, etc. The USDA and other federal programs have a multitude of other programs not highlighted that people can qualify for. The DOD has a program of their own called FSSA (Family Subsistence Supplemental Allowance). When I tried to research the FSSA website...it was down. Through speaking with military families, I found that most who had used food assistance have used WIC or SNAP. According to WIC's website, the program provides food, nutrition education, and referrals to health, welfare, and social services. The responses I received from military families who have participated in the program were overwhelmingly positive. One anonymous dual military family described their experience to me, "I got WIC as a single parent/soldier e4. When I married my husband (also a soldier) we were ineligible by 1 BAS payment as an e3 and e4. WIC helped a ton with groceries and saved us at least $30 every month...the WIC program at my post was fantastic to work with. They were all kind and knowledgeable. But it is sad how many military families need WIC." SNAP is the largest food assistance program in the nation. There are more requirements to receive this benefit and many military members do not qualify. I heard from many that it was difficult to be accepted to receive SNAP benefits due to BAH being counted toward your income. I have been told conflicting statements about whether or not BAH still counts toward eligibility but it varies state by state. One anonymous spouse explains, "Back in October of last year, we hit hard times as many do. We were stationed at Camp Lejeune. Due to a mess up in pay, they held her check for two and a half months, the first check after that was a total of $52. We went to the food stamp office [SNAP] and applied. Due to making $100 over the limit in a month "normally" they could not supply us with any type of assistance. We went to food banks and got what we could, and thankfully we're able to have support from her FRO that brought the guys together and helped us for a month." Whether or not BAH should be counted toward your income is quite literally up for debate and could soon become federal law. California Congresswoman Susan Davis introduced the Military Hunger Prevention Act back in 2016. The bill has recently been resubmitted to the Congressional Subcommittee of Military Personnel. According to the Congress.gov website, "This bill excludes the value of a housing allowance for a member of a uniformed service from any income, assets, or resources calculation for determining eligibility for any federal program issuing benefits for nutrition assistance (including the family subsistence supplemental allowance program.)" There is simply not enough information on how many military members and their families use these programs. The Government Accountability Office wrote a scathing report about the lack of reporting from DOD on this issue back in 2016. A recent Military.com article highlights that an increase in military spending might help this issue but a proposed cut to food assistance programs could also hurt those in this situation. I found military families divided when it comes to these programs. Some think they should only be for the short term and the requirements should be tougher to get assistance. Others think that these programs should not exist at all. When I asked a group what they thought made people turn to these programs, anonymous spouse explained, "Poor decisions. With all of the benefits, programs, BAH, Tricare, special pays, etc. there aren't many reasons why someone would need assistance." I heard versions of that response by multiple people. Many stating that military provides plenty of assistance and benefits that would prevent families from being in this situation. They had seen people they know abuse the system multiple times or spend their money on things like new cars and tvs instead of formula for their baby. I have seen this happen myself although I would not call it a chronic problem. Unfortunately, even people in the military will abuse the system. Many people suggested that families look into the multiple budgeting classes that the DOD provides. A great resource for these budgeting classes and information is on MilitaryOneSource. I don't know what the right answer is to help make sure less families are on food assistance. We could just say "Give everyone a raise," but that is easier said than done. Even if you do give someone more money, that is no guarantee that something will not happen where they need to utilize these programs again. The biggest thing I gathered from researching this subject is WE NEED MORE DATA. There are so few numbers to go off of and we cannot fix a problem if we don't know the extent of it. Only when there are hard numbers can we truly begin to take the steps needed to make military families less reliant on these programs.